October turned out to be a poor month for hedge funds across the board. In a marked departure from the positive to spectacular returns seen in the last five months, almost all the Eurekahedge regional indices took a southward turn. The exceptions were Japanese hedge funds (the Eurekahedge Japan Hedge Fund Index was up an impressive 1.7% for the month), and to a much lesser degree, onshore Latin American hedge funds (whose corresponding index was up 0.6% during the same period). 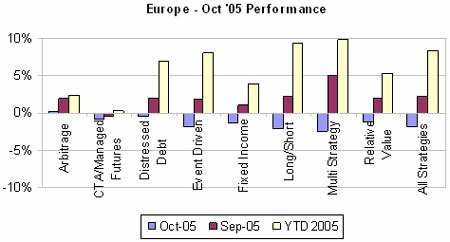 The North American and European indices, on the other hand, registered negative returns of 1.3% and 1.8% respectively. There was no major catalyst to blame for the month's turnout. Corporate and macro-economic fundamentals were generally optimistic. It was really a month of short-term market correction of the variety August saw a hint of (in the form of a dip in the return-gradient), but was more pronounced by a spate of profit-taking. Global inflationary pressures also got the better of investors' risk appetites and exacerbated the fall. To speak more specifically from the perspective of hedge fund performance, the market was also influenced by rumours of redemptions. However, new issuance is still robust. This has improved pricing towards the end of the month, marginally in Europe and more pronouncedly in Japan, and kept demand strong. With the past few months' returns driving a bullish market sentiment, many funds have also been unable to exit bad positions quick enough, setting off a stop-loss panic. The key events guiding market trends in October were 1) the announcement of Ben Bernanke as the new Federal Reserve chairman, 2) the REFCO crisis and the issue of counterparty risk, and 3) worsening inflationary pressures in the US. In short, a decline in risk appetite coincided with a technical correction, and hit hedge fund returns across almost all regions, the trends wherein are discussed in greater detail in the following pages. The US equity markets, which showed a certain resilience in September in the face of back-to-back hurricanes and energy-related disruptions, plunged during early October although they recovered some lost ground during the later part of the month. The S&P 500 Index and the NASDAQ Composite Index were down 1.8% and 2.5% respectively for the month. Also, a string of factors/events – the announcement of Ben Bernanke as the new Federal Reserve chairman, the earnings season, declining oil prices – kept the equity market movements highly volatile. The treasury markets continued on their downward path from September, with 10-year yields rising from 4.3% to 4.6%, amidst the Fed's concern over inflation and its persistence on short-term rate hikes. Despite the rate-hike policy, or rather because of it, the markets finally saw a steepening of the yield curve, with the spread between 2-year and 10-year notes rising from 16 to 37 basis points. Energies too had a bearish run in the month leading up to the winter/heating season. This owed to the fact that there were lesser supply blockages and warmer weather, than the markets had earlier expected. The production/refining facilities incapacitated by the hurricanes of the past few months were also brought back on track during the month. Crude prices dropped from US$66 to nearly US$60 per barrel. Similarly, gasoline was down 27% and natural gas 12%. Fixed income funds were the only ones that finished the month in positive territory in the North American universe, returning 0.4%. Managers predicting an inversion of the yield curve based on the narrow-spread trend of the past few months and the Fed's stand on short-term rate hikes would have pulled down the average return figure for these funds. In the US event-driven space, adverse price movements in the underlying asset classes of many merger arbitrage opportunities (for a variety of reasons such as tougher financing conditions and events impacting specific deals), helped explain the sub-normal returns generated by these funds for the month. Case in point: the drop in the stock of Spinnaker Exploration Co (to be acquired by Norsk Hydro) after fears over an assumed breach of a clause in the deal. Other major blows for US event-driven funds came from such deals as Petrokazakhstan - CNPC, Guidant - Johnson&Johnson and School Speciality - Bain Capital. The volatility of the equity markets, on the other hand, took its toll on long/short funds. These funds were also hit by companies reporting lower-than-expected fundamentals. The US economy continues to see inflationary pressures building. Coupled with robust micro-economic indicators for October, this would mean that the Fed can be expected to continue with its credit-tightening policy in the near term. European equities also plummeted during the month, with the MSCI Europe Index down 2.6% for the month. Energy-related stocks were the worst-hit as they had to absorb the impact of the twin fall in oil prices and equity markets. This had a direct bearing on the performance of oil-sector-heavy markets such as Norway, which was down 7.9% for the month. European bond yields rose sharply (over 20 basis points for the month), also triggered by mounting inflationary pressures and the ECB's hawkish comments. A hike in the index rate before the end of the year is expected. Emerging equity markets in Europe registered a steep decline in October, with the MSCI EMEA Index returning -7.1%. This profit-taking spree was spurred on mainly by rising global inflationary fears. Russian equities followed suit too, betraying their over-dependence on strong oil prices for their economic well-being, and by extension, their structural inefficiencies. South African equities witnessed an even more pronounced fall at -10.3%, accentuated by the weakness of its currency against the dollar. Mining stocks, however, did well through a combination of weak currency and strong metal prices. Arbitrage funds were the only ones with positive returns for the month, although at a miniscule 0.2% for the month. There were enough players/long-portfolios hit by the downward trend, which was in turn brought on by a combination of factors such as the oil price decline, profit-taking, and concerns over redemptions, to almost nullify any positive ground the rest of the players or the hedge/short portions of their portfolios might have gained. Also, convertible arbitrageurs had it rough because of the decline in the equity market. On the other hand, multi-strategy funds were the worst performers during October, drawing the Eurekahedge European Multi-strategy Hedge Fund Index down by nearly 2.5%. With almost all sectors and asset classes taking a turn towards the negative, diversification was not of much help. A reasonable portion of the funds were oil-sector heavy, and precisely these sectors – oil & gas (-7.4%), auto & parts (-7.5%) and transportation (-6.6%) – were the worst-hit during the month. This, coupled with the general weakness of the equity markets, explains why long/short funds and event-driven funds fared poorly. European economic data was largely positive. Eurozone core inflation, at +1.3% year-on-year, was below expectations. M&A activity is on the rise, spelling a greater breadth of opportunities for arbitrage, event-driven and special-situations players. Valuations in European equities are also attractive, as evidenced by recent large cash deals, such as Telefonica's US$12 billion bid for O2. 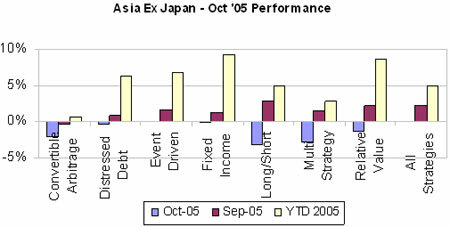 Japan was the only exception to the trend of plunging equity markets. Topix returned a very healthy 2.3% for the month, while the Nikkei 225 was up 0.2% for the same period. But these numbers don't tell the complete story – Japanese equities underwent a phase of sharp volatility earlier in the month (with the Topix experiencing its largest drop and its largest rise for the year, within a span of a week), followed by a steep decline mid-month and then a steep recovery in the last few days to finish the month in positive territory. This positive turn can be attributed to timely interim results announcements that were generally upbeat. Also, Japan's quarterly Tankan survey came out lower than expected, and the inflation numbers continue to be deflationary. The US markets' positive reaction to the announcement of the Fed's new chairman also had its effect. Quite unsurprisingly, the same strategies – event-driven, long/short and multi-strategy funds – that bore the brunt of the markets' downward movement in the US and Europe were the ones that benefited from the end-of-the-month trend reversal. The Eurekahedge Japan Event Driven Fund Index rose a spectacular 2.9%. M&A events such as Fuji Heavy Industries Ltd's announced tie with Toyota Motor Corp, after calling off its alliance with General Motors, helped returns. The key performing sectors were banks, insurers and small caps. Cyclicals and pharmaceuticals were some of the weak sectors. Relative value funds, on the other hand, were hurt by the see-sawing of the markets and were the worst-performing and the only negative-return-generating strategy for the month. In Japan too, as in Europe, corporate valuations are good, and companies are reporting positive returns. Furthermore, investment inflows continue to be healthy, and as reaffirmed by trends we have observed in the past few months, Japan is reasonably insulated from adverse global market-moving events in the US. The upward movement in the market may be reasonably expected to continue. Markets in the rest of Asia, on the other hand, could not escape the almost overarching trend of inflationary pressures leading to lowered risk tolerances and to earlier-than-expected securing of year-to-date returns, despite healthy micro-economic data. The MSCI AC Asia-pacific ex-Japan Index fell 6.4% during the month. Investors' revived enthusiasm for the Japanese market has also drawn away some of the attention to the rest of the region. Asian markets also had the avian-flu scare to contend with. Increased capital-raising activity, of which the huge IPO by China construction bank is but an example, has also put pressure on the Asian markets by siphoning off some of their liquidity. There was a general erosion of value across asset classes and regions. In Australia, the ASX 500 fell 3.9%, owing not just to global market movements but also due to lack of any clear corporate earnings guidance during the AGM season, while the Australian currency weakened against the US dollar. The big losers for the month were energies, industrials and materials. However, the Index saw some gains towards the end of the month. In Korea, the KOSPI fell by 5.2%, with foreign investors becoming net sellers of US$2.5 billion for the month. Hong Kong's Hang Seng H-share Index was down 6.9%. In India, the Nifty Index was down 8.8%, while the Indian rupee recorded its worst monthly loss for the year depreciating 2.5%, with foreign institutional investors becoming net sellers of about US$840 million. Nevertheless, market participants continue to be upbeat about macro-economic fundamentals and corporate valuations, as well as in growth expectations, particulary in China's growth. Q3 numbers show Korea grew 4.4% year-on-year in the third quarter, exceeding market expectations on consumption and exports. Chinese economy grew at 9.4% in Q3. Event-driven funds closed the month flat at 0.01%, and have bucked the negative-return trend through the increased level of activity in the region's M&A and capital-raising space. Long/short funds were the worst hit for the month drawing the corresponding Eurekahedge Index down 3.2%, owing to most funds reaching their stop-loss limits in steeply trending markets. Multi-strategy funds also experienced erosion of value as the decline hit almost all asset classes and most of the economies in the region. All this was reflected in the rather poor showing of the Eurekahedge All Strategy Asia ex-Japan Hedge Fund Index, which returned -2.7% for the month. While global trends such as mounting inflationary pressures and declining US consumption persisted, the month's decline is largely attributed to a short-term market correction, and a "nudging ahead" of what is typically a pattern seen towards the end of the year. Indeed equity markets in most Asian equities, including Korea, India and Australia are on the rebound, going by end-October and early-November market data. In Latin America too, the markets were generally weak and highly volatile, staging recoveries only towards the close of the month. The MSCI Latin America Equity Index dropped 5.5%, although the situation was less grim in a sector-wise review of movements in equities – oil-related stocks suffered losses of about 10% but telecoms had a good run in Mexico, Chile and Brazil. Emerging bonds also got dragged down by the US treasury market movements. A devaluation in the currency further hit Argentine peso bonds. And yet, most economies saw an improvement in fundamental/fiscal health. Global growth indicators remain strong and so do corporate earnings figures. For instance, the political crisis in Brazil has had no appreciable impact on either market movements or the general popularity of the Lula establishment; things look positive on the economic front too, with Brazil registering a large trade balance surplus and healthy growth in international reserves. In Argentina, the re-election of the incumbent president in the recent country-wide elections was a reaffirmation of the success of the government's policies. Among Latin American hedge funds, onshore funds outperformed offshore funds, even showing positive returns at 0.6% for the month. This should come as no surprise, as the key catalyst in the month's decline across the board was profit-taking investors, and it was the onshore funds that enjoyed the most surges in liquidity over the past few months. Moving on to a more specific review of the performance of Latin American funds, long/short and pair-trading funds had the same story to tell – of the short side being less hurt than the long side, and not entirely hedging the loss component. These funds were consequently down a staggering 4.8% for the month, drawing down the overall index to a rather poor -2.5%. Onshore funds allocating to the relative value strategy also got hurt, returning negative 3.9% for the month. 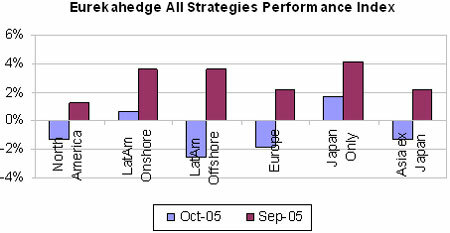 Offshore funds allocating to other strategies had a relatively better time, with most of them returning under -1%. Among the better performing onshore funds, CTA and fixed income funds had a good run. This may be explained by the fact that Latin America is particularly sensitive to US treasury yield rallies because of its heavy sovereign debts and also because its main exports are commodities. Funds that understood that commodity prices could therefore be affected negatively in an environment of rising interest rates fared well in October. The outlook for emerging markets is still largely positive because the economic fundamentals are in some cases (such as India, Brazil) even more robust than in developed economies. Equity trends from early November are also positive. So while inflationary pressures and investors' risk aversion hover on the market scene, profit-taking investors may be expected to be drawn back by the positives. To conclude, October's market movements were largely the result of a short-term market correction. There was a hint of it in August (as evidenced by the dip in that month's return gradient), but not the spate of profit-taking and the subsequent panic-selling, that was seen in October. But why do we think that this is just a short-term correction? The MSCI Europe Index had its best run of the year on the last trading day of the month. Japanese equity indices too recovered most of the month's losses in the last few days of trading. Other emerging market equity indices also showed similar trends. But more importantly, almost all the emerging markets that saw a draining of liquidity and significant draw-downs, were economies which had positive, if not strong, fundamentals. So while the following end-of-the-year months could be a little unpredictable just like this one, owing to lowered risk appetites, we expect market trending to return to more normal and healthy patterns in the near term. Preliminary NAV returns for November indicate returns in the 0 to 2.5% range. Please visit Indices for a daily update on index returns. 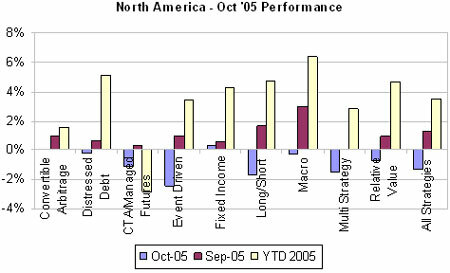 1 Based on 73.69% of the NAV data for October received to date (2 December 2005). 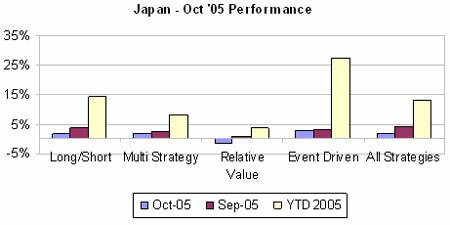 2 The All Strategies Index is a separate index and derives its value not only from the actual performance of the listed strategies for the investment region but also from the strategies which are not listed (due to strict Eurekahedge indices guidelines) but having the same investment mandate.